Some items are kept in the library so everyone can have access to them. Reference books, periodicals, CDs and CD-ROMs, microforms, and items on reserve or in special collections fall into this category. Most items may be borrowed, or circulated, by members of the DBU community. Select "Sign In" next to "My DBU Library Account." (top right of screen). Password – the first time you will need to select the "set/reset password" option and a password link will be sent to your DBU email. Use the link to set your own password. See the due dates for items you have checked out. Renew your checked out items. Place a Hold request on an unavailable item. See any fines you may owe. “Checkout” means to borrow books or other items from the Library. Most items can be checked out to you so you can take them from the library; we check them back in when they are returned. Bring your current DBU ID card to check out items. You are responsible for items checked out in your name – don’t loan your card or your library items to anyone else. Bring all items, including those from the 2nd floor, to the circulation desk at the front of the 1st floor to check them out. The length of the checkout period depends on the type of item you borrow. 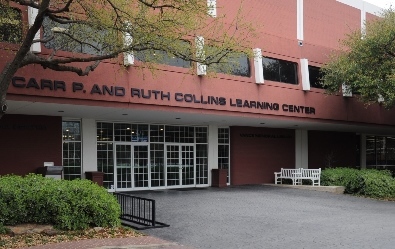 In front of the Collins Learning Center, left of the doors. Slot in the circulation desk, just inside the Library doors. Videos and DVDs must be returned to the basket on the circulation desk—using the book drops could result in damage to the items. Reserve items must be returned to the basket on the circulation desk. If possible, tell the person on duty that you have returned a reserve item. Graduating students should return all Library items by the first day of the month in which they graduate, i.e., May 1st, August 1st, or December 1st. Need your items longer? Renew your checkout period. Borrowed items may be renewed ONLY once, before they are due. If someone has placed a Hold on your item, you won’t be allowed to renew it. Provide your name and DBU ID number. Include title, author, and barcode number from item. Online: complete the Online Renewal Form. 1. Choose "My DBU Library Account" (top right of screen). If you haven’t set up your library account, follow these directions. 2. Item[s] checked out to you will appear in a list. 3. Click "Renew" for each item you wish to renew. REMEMBER: If you checked out the item using ILL, you will need to contact the ILL Supervisor. Different rules may apply. Be courteous to your fellow students – turn in your Library materials on time! If you don’t, you may have to pay a fine. Overdue notices will be emailed to your DBU email account. Failure to receive a notice does not remove the student's responsibility to return materials or pay fines. Late fines must be paid at the circulation desk by cash or check. When an item is 50 days overdue, it is considered lost. Lost items result in a $50.00 lost item fee. If not paid within 10 days of notification, lost item fees will be transferred to the student's DBU account. Failure to receive the notification letter does not absolve the student's debt. If a lost book is later returned to the library, the student will receive a refund of $37.50 ($10.00 for Videos/DVDs). The maximum overdue fine ($12.50 for books; $40.00 for videos/DVDs) will be assessed and subtracted from the total lost item fee. Failure to pay fines (over $10.00) or return materials will result in a suspension of library privileges. This includes TexShare and interlibrary loan privileges. Fines for interlibrary loan items are usually $1.00 per item per day and are the responsibility of the student. Any fines or fees that have been transferred to the student's account must be paid in the Cashier's office. If the item you want is checked out, you may place a "Hold" on the item, so it can’t be renewed or checked out by anyone else. Search for the item in the online Library catalog. Click on the title of the item. Enter your DBU ID number and password where prompted. Select "Submit." You will be notified by DBU email when the item is available. NOTE: you cannot place holds on Reserve or Reference items. Someone from the Library will call you, requesting that you return the item within 3 days. Items that are recalled cannot be renewed, and Holds cannot be placed on them.